Mike Tyson vs. Muhammad Ali: An In-Depth Analysis of Who Would Really Win in a fight? By Marcus Smith , Contributor Jan 24, 2011 When I opened Microsoft Word to write this article, Tyson was winning by the length of his trademark gold tooth. The tally stood at 25 votes for Iron Mike, 24 votes for Muhammad Ali, two voters predicted a draw, and one voter thought the fight would end due to ear biting ;-). Few sporting debates can incite a riot like Ali vs. Tyson. In most major sports (football, basketball, soccer, etc) loyalty is a location-based commodity. New York Yankees fans despise Red Sox fans. Green Bay Packers fans detest Minnesota Vikings fans. Due to Lebrongate, Cleveland Cavaliers fans now detest the Miami Heat. In boxing, loyalty is an age-based commodity. The shelf life of a person who takes uppercuts to the chin for a living is understandably short. In addition to that, at any given time there are typically no more than five boxers with enough talent, fanfare, and personality to cultivate a ravenous fan base. Age related debates are fueled by emotion and facts are rarely on the menu. Combine that with the incredibly short supply of boxers to idolize and you have all the ingredients of a ready-made civil war. I’m a veteran of Ali vs. Tyson debates. I like boxing and I love arguing so its heaven for me. Trust me when I say it normally takes about 30 full seconds for the entire discussion to dissolve into drivel. Team Ali is usually comprised of older gentlemen. They dig in and say Ali was entirely too fast for a lumbering half whit like Mike Tyson. Team Tyson is normally composed of younger gentlemen. They dig in and defend Mike Tyson’s herculean punching power and intimidating persona. Team Tyson always, and I mean always, predicts a quick knockout from Kid Dynamite. If you know anything about boxing then you know both arguments are unfounded. Let’s quickly clear them both up. Muhammad Ali was just too fast – Muhammad Ali fans have a love affair with his speed. Ali was very fast. The legend of his speed was magnified by the fact that most heavyweights of Tyson’s time were slow as molasses. He relied on his quickness and agility to avoid punches. Which means his defense was the boxing equivalent of Russian roulette. It was this game that led his face to be the pounding pad for thousands of well-placed punches. For all of his quickness and speed, Joe Frazier beat Ali within an inch of his life in their first encounter. Mike Tyson would quickly knock Ali out – Mike Tyson fans have a love affair with Tyson’s power and intimidating persona. Mike Tyson made grown men quiver and scream. Mike Tyson’s intimidating ring entrance and ice-cold stare broke many opponents down. None of those men were Muhammad Ali. Ali withstood the thunderous hooks and uppercuts of George Foreman, Archie Moore, Joe Frazier, and Ken Norton without being knocked out. Sonny Liston was arguably a more intimidating boxer than Mike Tyson because of his mafia connections. Muhammad Ali made a mockery of him and embarrassed him twice. If you’re going to have a discussion, especially a fantasy discussion, in which you compare boxers then you need to look at no less than 9 things. Style – How does he box? Punching Power – Is he swatting flies or cracking jaws? Speed – Can you see his punches coming or do they sneak up on you? Chin – Can the boxer take a pounding and stand his ground? Defense – Is he a human punching bag or is he hard to hit? Heart – Does he have the desire to peel his sweaty carcass off the canvas and return to battle? Psychology – Can he get inside his opponent’s head and nullify his training? Key Losses – Who did the boxer lose to and why? Stamina/Endurance – Is he grabbing his knees in the eighth round? Anything short of this involves too much speculation and emotion. Like I said before, the conversation eventually breaks down into drivel. It is well known that styles make fights. A world-class puncher can frustrate and defeat the most powerful beast around. A patient fighter can pound a great defender’s arms until they drop, creating the opening that ends the fight. This makes boxing great. Muhammad Ali created his own style and violated every rule of boxing along the way. His hands dangled loosely by his side. Instead of using his arms to block he leaned back to avoid punches. He threw a variety of looping punches from ridiculous angles. He was a notorious headhunter with little concern for body shots. Ali’s natural gifts afforded him the luxury of spitting in the face of boxing’s established rules. In the book Ali in Action: The Man, the Moves, and the Mouth, Ali is described as a heavyweight with the hand speed and reflexes of a welterweight (page 11). He stayed on his toes, gracefully danced around the ring and exclusively targeted his opponent’s head with deadly four-punch combinations. Ali would wear an opponent down and go in for the kill when his opponent couldn’t defend himself. His style was frustrating for another reason. Ali had the reach to land authoritative shots from a distance. Ali is legendary for keeping his opponents at a safe distance while simultaneously landing power punches. Everything he did in the ring served to create and maintain the operating space he desired. Imagine yourself in the ring with Ali. You are fighting a person who is taller AND faster than you. When you approach, he gets on his tiptoes, takes two steps back, then lands three power shots to your face during his retreat. You stand there bewildered. Surely something is afoot! Dazed and confused you decide to cover your face and attack his body. Your opponent floats to the right and delivers a crushing uppercut to your chin. Your natural defense systems kick in and you unleash a flurry of punches that have no hope of connecting. While you contemplate your next move he decides to hit you with five lightning quick power shots to the face. You go down with no hope of getting up. Take a bow (if you can), you have just experienced 20 seconds of boxing Muhammad Ali. Mike Tyson was a different animal altogether. Tyson moved straight ahead with evil intent. Mike Tyson used the peek-a-boo guard to protect his face and body. When he dropped his guard, he was doing so to unleash weapons of mass destruction. As a result, the opportunity to hit Tyson was a double-edged sword. If you attacked Tyson, you were going to get hit and it wasn’t going to tickle! At his most effective Mike Tyson was a combination puncher who unleashed violent body and head quartets that would shorten anybody’s night. Tyson has often said his goal was to punch through his opponent’s head. Sound’s delightful doesn’t it? Fighting Mike Tyson was just as bad (if not worse) than fighting Muhammad Ali. Imagine yourself standing toe to toe with this monster. You throw two punches at his peek-a-boo guard. The impact is laughable. As your second punch comes back, you see a flash of dark flesh moving. You’re not sure what happened but you know it hurts. Both sides of your stomach recoil in pain. As you bend over you catch two left hooks to your right cheek. Your mouthpiece drops out, you lose your equilibrium and kiss the canvas. Pick you chin up, you’ve just experienced 20 seconds of boxing Mike Tyson. Mike Tyson’s style is definitely more intimidating than Muhammad Ali’s. Tyson could stop a fight in a hurry. Ali gets the nod from boxing history on this one though. Boxing has had its fair share of power punchers, but the greatest in the sport have always had the ability to deliver punishment and disorient opponents for an extended period of time. Mike Tyson sorely lacked this ability. Ali was an effective puncher. He had 37 knockouts in his career. Only 12 of those are what most folks consider a true knockout. He had 25 TKOs in which he outclassed his opponent and the referee stopped the fight. 36 of Ali’s wins came in the seventh round or later. In fact, he won more rounds by going the distance than any other way. He won 18 fights in the final round (11 in round 15 and 7 in round 12). Tyson’s goal was to kill you early. Every blow that came from Tyson was explosive. A staggering 41 percent of Mike Tyson’s fights ended in the first round. His next highest total was 12 percent in the second round. Mike Tyson’s first championship victory most adequately displayed this titan’s power. In a truly humorous scene, Mike Tyson chased Trevor Berbick around the ring landing power shot after power shot. The last punch was a precise left hook. That blow led to one of the most humorous knockouts in boxing history. Trevor Berbick lost his composure and crumbled to the ground. Berbick stood up, tripped over his own feet and fell down. For his last trick Berbick stood up and slumped into the loving arms of Mills Lane. Larry, Moe and Curly from the Three Stooges couldn’t have done it better. Everyone laughed…everyone except Trevor Berbick. Tyson’s power and fury was unparalleled. Mike Tyson registered 23 TKOs and 21 KOs. He ended 41 percent of his fights within three minutes. That’s power! Speed in boxing is measured two ways: hand speed and foot speed. Hand speed measures how quickly a person can get off a punch. Foot speed measures how quickly a person moves around the ring. Ali is the clear winner when it comes to foot speed. He had speed that a man of his size wouldn’t normally possess. Ali had quick hands as well, but his hand speed was nowhere near as lethal as his foot speed. For years Mike Tyson’s hand speed has been overlooked. He packed such lethal punches that few people noticed his speed. In his documentary, Mike Tyson states that he studied quick exciting boxers and he modeled his style after them. Watch a few clips of Tyson throwing punches and you’ll see what I mean. Tyson would whip out five or six hooks and uppercuts in the blink of an eye. It was extremely rare to see a boxer beat Mike Tyson to the punch. Mike Tyson was not the fastest when it came to foot speed, but he used what he had to stalk opponents and punish them. Mike Tyson faster than Ali?!!??? I can hear the moaning now. That’s right I said it. Tyson was faster in the ring for all practical purposes. Muhammad Ali relied on his foot speed as his main defense. That foot speed failed him SEVERAL times. Ali took SEVERE punishment from Max Schmeling, Oscar Bonavena, Joe Frazier and Ken Norton. Anyone who applied a decent amount of pressure to Ali could nullify his quick feet. Tyson fought from a traditional stance so he didn’t waste nearly as much motion as Ali. When he avoided a punch he did so with a lightning quick snap of the head. When Ali avoided a punch it often involved a lean, a foot shuffle and a trip to the corner store. Tyson’s persistent pressure and precision punching nullify Ali’s foot speed. Mike Tyson’s armor came with a major chink. His chin was relatively nonexistent. It was never really tested, but it failed on those rare occasions that he needed it. His chin was put to the test in bouts with Lennox Lewis (Tyson was KO’d), Evander Holyfield (Tyson lost on a TKO in which he admits to blacking out) and Buster Douglas (Tyson’s most infamous KO loss). Ali’s face was used as a punching bag several times. Many people consider George Foreman the hardest hitting man in boxing…EVER. Ali invited punishment against George Foreman in his prime! He took a tremendous beating in his only loss to Frazier and didn’t fall until Frazier landed a picture perfect leaping hook in the 15th round. 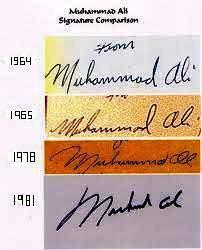 Muhammad Ali’s chin is legendary. The only KO of any kind on his record was against Larry Holmes when Ali was 38 years old. Mike Tyson was knocked out five times. There really is no comparison in this category. Ali’s theatrics, record and entertaining style are romanticized to the point that they hid a dramatic flaw in his game. His defense was awful. His arms were never in a defensive position and he relied solely on his instincts for defense. Ali’s propensity to headhunt and his refusal to defend his body gave opponents plenty of real estate for contact. Ali’s lackadaisical stance and defense left him open for a Tyson favorite, the left hook (which he absorbed routinely in his career). As a result his chin and heart were tested several times when a good defense would have prevented this. Mike Tyson didn’t have the best defense. However, he wasn’t open for business the entire fight like Muhammad Ali. Tyson (five KO losses) was knocked out more times than Ali (one KO loss) but he didn’t take nearly as much punishment. Tyson wins this category because unlike Ali he made an attempt to defend himself. Ali’s cockiness made it easy for an opponent to land big shot after big shot. Tyson would exploit this opportunity and land several power shots. Boxing is often called the sweet science. There is a reason for that. Boxing, more so than any other sport, is a blend of technical ability and desire. It is a primitive sport in which a person’s will (or lack thereof) is apparent. Mike Tyson never displayed great heart. He fought back to win against Razor Ruddock but that was basically it. After taking punishment, he was visibly demoralized in bouts with the “Irish Champion” Kevin McBride, Evander Holyfield and Lennox Lewis. Tyson could dominate a fight, but he didn’t possess the will to dig deep and deliver punishment when the chips were stacked against him. Muhammad Ali was a true warrior with an astounding amount of heart. To some people he showed a little too much. Ken Norton broke Ali’s jaw early in their first fight. Ali fought for at least seven rounds with the pain of a broken jaw that got worse with each round. Henry Cooper knocked him down in the fourth round. Ali won the fight. Chuck Wepner knocked Ali down in the ninth round. Ali won the fight. Sonny Banks knocked Ali down. Ali won the fight. Ali had heart to match his incredible physical gifts. Despite taking a debilitating amount of punishment he was never knocked out cold. He got up every single time he got knocked down. Ali was often better AFTER he got knocked down. That’s a scary thought. Psychology was a major factor for both Ali and Tyson. Muhammad Ali used psychology as a weapon. Mike Tyson used it as a crutch. It was hard for Tyson to defeat an opponent who didn’t fear him. In his documentary, Tyson flat out says the following, “I walk around the ring and never take my eyes off my opponent. I’m looking for a sign of his fear. He’ll fight hard for two or three rounds but I KNOW I broke his spirit”. Tyson relied on fear, but he struggled openly when boxers did not fear him. There was another major chink in Mike Tyson’s psychological armor. His confidence was directly tied to Cus D’amato. D’amato built up Tyson’s confidence in himself and Tyson lost a good chunk of that when D’amato died. You can’t escape a good debate about Mike Tyson without hearing, “if Cus D’amato didn’t die.” Nobody can deny Cus’ standing as a great trainer. However, Tyson’s admitted reliance on D’amato is a definite weak point. Muhammad Ali was a psychological machine. He unnerved Sonny Liston by showing up at his training camp and starting a circus. He routinely distracted opponents with pre-fight taunts, poems and jokes. He predicted the round in which his opponents would fall (Archie Moore in four, Powell in five). He called Joe Frazier (a man who helped bring him back into boxing) names like Uncle Tom, Flat Nose, Gorilla and Moon Cricket. His antics angered Frazier so much that it took over 20 years for Frazier to forgive him (even after Ali was stricken with Parkinson’s). There is another thing about Ali’s psychology that not many people know. His trainer Angelo Dundee actually trained against him in his fight with Jimmy Ellis. Ali overcame this obvious tactical disadvantage and beat Ellis in 12 rounds. Muhammad Ali was able to frustrate his opponents before, during and after the fight. Ali wouldn’t be afraid of Tyson and his pre-fight antics would frustrate Tyson. Every fighter, no matter how great he is, will eventually lose a few (except a select few like Rocky Marciano). Great fighters may appear super human but they all have a weakness. Mike Tyson and Muhammad Ali both had two throwaway losses at the end of their careers. Mike Tyson lost to Danny Williams and Kevin McBride well after he should have stopped boxing. Muhammad Ali lost to Larry Holmes (in a pitiful affair) and Trevor Berbick well after he should have put the gloves down. Ali had three legitimate losses (Ken Norton, Joe Frazier and Leon Spinks). His most famous opponent was Joe Frazier, and that makes sense because Frazier was the first man to beat Ali. However, Ali convincingly won in their next two fights. He won a unanimous decision in 1974 and he earned a 12th round stoppage in the “Thrilla in Manilla” in 1975. The boxer that gave Ali his toughest bouts was Ken Norton. Ken Norton was a heavy underdog and won his first bout with Ali in a split decision. Ali went on to defeat Ken Norton two more times. Ali’s decision victories over Ken Norton are among the most heavily disputed wins in boxing history. So why did Ali struggle so mightily with Ken Norton? Ken Norton fought Ali from the OUTSIDE. Norton neutralized the jab that set up most of Ali’s speedy combinations. Norton mirrored Ali’s jabs and caught Ali with well timed power “pot shots” that obliterated Ali’s rhythm. The Norton fights were the only fights in which Ali openly struggled to find a groove. Tyson had four legitimate losses (two to Holyfield, one to Lennox Lewis and one to Buster Douglas). All of his tormentors had similar physical characteristics. Buster Douglas was 6’3” with an 83” reach that gave Tyson major trouble. Douglas danced and delivered the type of shots that Ali would deliver. Lennox Lewis was 6’5” with an 84” reach that dominated Mike Tyson. Evander Holyfield was 6’2” with a 78” reach that kept Tyson at bay. Tyson had a 71” reach which made him most effective in close quarters. His short reach gave him trouble against tall fighters who moved and applied pressure. Ali was a tall fighter that moved and applied constant pressure. Muhammad Ali’s style was the exact style that gave Mike Tyson major trouble. He was tall, his reach was long and he kept fighters at bay with a mix of quick powerful shots. Tyson never defeated a fighter of this style who wasn’t afraid of him. Tyson was a power fighter who only had 18 fights (32 percent) go past the fourth round. Tyson fans will point to his devastating punching power as the main driver behind this statistic. In his documentary, Mike Tyson provides contradictory information that no fan can deny. Tyson says, “I had a lung problem, that’s why my fights didn’t last long”. 48 or 85 percent of Ali’s fights went past the fourth round with the majority of them going the distance. Tyson’s power and suspect lungs kept him out of long fights, but his lack of endurance was apparent in fights that went long. Tyson lost six fights; five of those losses came after the fourth round. When you compare the fighters from the rounds fought, perspective things get even worse for Mike. Muhammad Ali fought 56 fights and Mike Tyson fought 58 fights. Muhammad Ali fought in 541 rounds while Tyson only fought in 211 rounds. That’s an astounding 330 round difference or the equivalent of 27.5 more 12 round fights for Muhammad Ali. That experience simply can’t be discounted. Muhammad Ali was a boxer who fought to embarrass and outclass his opponents. He found weaknesses and punished opponents in the long haul. The case can be made that Tyson would knock Ali out but it wouldn’t hold much weight. Muhammad Ali lost five fights, four were decisions and only one was a TKO at the extreme tail end of his career. Muhammad Ali withstood punishment from heavy hitters like Joe Frazier, Archie Moore, Ken Norton, Ernie Shavers and George Foreman without being knocked out. It’s safe to say that Mike Tyson wouldn’t have knocked him out either. Tyson was a physical marvel and it shows in the categories that he has over Ali. Tyson is superior to Ali in Power, Speed and Defense. These are all critical components of boxing. Ali was a more complete warrior than Mike Tyson. As a result he takes home six categories…Style, Chin, Heart, Psychology, Key Losses and Stamina/Endurance. There is also something else to note. Ali, while inferior to Tyson, was no slouch when it came to power and speed. Tyson, on the other hand, had major deficiencies in chin, heart, psychology and stamina. Any opponent who beat Ali did so in a hard fought battle that went AT LEAST 10 rounds. Frazier won a unanimous decision in 15 rounds. Ken Norton won a split decision in 12 rounds. Leon Spinks won a split decision in 15 rounds. Larry Holmes won a TKO in 10 rounds. Trevor Berbick won a unanimous decision in 10 rounds. In order for Tyson to beat Ali he’d have to take him down and take him down quick. Some of the best boxers in American history couldn’t do it and Tyson wouldn’t do it either. This fight would be hard fought for the first few rounds. In round five or six Ali would begin to outclass and frustrate Mike Tyson. Tyson was known to get anxious (as he was known to do) in those middle rounds and take big risks with punches. He’d connect with just enough shots to open himself up for major punishment. By round 10, Tyson would be clearly outclassed and looking for a way out. He’d get it in the form of a unanimous decision for Ali. Sorry Tyson fans, its just not in the cards. Pacqiuao would lose against Mayweather Jr.
By Tom Drury: This subject has run its course and won’t be answered until and if the fight ever happens. That said I feel the need to write this article because some of the arguments for a Manny Pacquiao win are ridiculous and some of the fans have asked why I believe Pacquiao offers no threat whatsoever to Floyd Mayweather Jr.
For the fans that post comments along the lines of Mayweather has never been out of his comfort zone, I would like to tell you the whole boxing world had the opinion Saul “Canelo” Alvarez was the man to take Mayweather out of his comfort zone, and we know what happened next. Manny Pacquiao is a boxer/fighter with KO power. His style is reckless but exciting I agree. Pacquiao only succeeds against other fighters/brawlers (fact). Pacquiao is a rhythm fighter; he stays on his toes and moves in and out in a straight line like an amateur. Most amateurs are taught this way at the start of their boxing career, move in on the attack and out to avoid the counter it is a great point scoring style. Pacquiao is a professional and I am not comparing him to an amateur; he has great power and speed, but this style only succeeds when he catches his opponent on the way in or is fighting an opponent that does not know how to box on the back foot or is not sufficient as a counter puncher. If Pacquiao does not succeed moving in on the attack, then he eats counters and is very vulnerable. Juan Manuel Marquez is a prime example. I believe Marquez won two of the first three fights, but Pacquiao got the wins, so I respect that. Marquez is a fighter but has great technical ability in regards to timing, positioning and countering. Marquez just has a tendency to fight. He is Mexican after all. The fourth fight was a prime example of technical soundness against reckless attacking. Marquez’s KO was no lucky shot; it was timed to perfection and exposed that bad positioning that Pacquiao all too often gets himself in. Pacquiao is a front foot fighter only and his all-round boxing skills are limited; not to mention the jab been nonexistent. Pacquiao’s whole game plan when entering the ring is offence. Freddie Roach, his trainer, is no doubt a great trainer but his ethics and lessons are based solely on front foot attacks and does not consider any defensive tactics. Pacquiao can expose weaknesses also in his opponent but only offensive weaknesses like Ricky Hatton 2009. I can remember a local amateur coach telling me two weeks before this fight took place “Pacquiao will KO Hatton with a left hook within 5.” The reason was both brothers Matthew and Ricky Hatton lower their right hand when throwing a left hook to build momentum on the punch. I am not a Pacquiao hater; I have paid for many of his pay per view cards, and have been lucky enough to see him fight against Hatton in Las Vegas. I have also been on the edge of my seat watching his wars with Marco Antonio Barrera, Erik Morales and Marquez. I appreciate him as a fighter. Mayweather Jr., in my opinion, is the greatest all round boxer of all time. He has no weaknesses to expose, his defence can’t be penetrated, his offensive accuracy can’t be matched, his timing is so on point it is scary, and footwork is totally unorthodox and out of rhythm that it takes his opponents’ timing away. His fighting brain is razor sharp, and the way he makes adjustments has never before been seen not to mention his hand speed and jab (the most important punch in boxing). Mayweather has one of the best jabs in the game; he sets up other shots with it he keeps his opponents off balance with it, and the way he finds his range so quickly is crazy. I am not going to babble on about Mayweather’s style because I’ll be in danger of been called bias. What I will say is there is no weakness for an offensive-minded fighter like Pacquiao to expose; none whatsoever, as Saul “Canelo” Alvarez found out. I couldn’t be so daft as to say Pacquiao could beat Mayweather based on styles, because that’s ridiculous. Mayweather is unbeatable. Offensive fighters won’t beat Mayweather. My opinion was this same opinion in 2010, and will always be the same Mayweather is far too superior to Pacquiao as a fighter he would box his ears off. Mayweather is faster, smarter, sharper of the mind, more accurate, impenetrable defense, best counter puncher in the game, and most elusive. What more do you need to realize. This would be a mismatch. If any fans have a valid argument for why Pacquiao would give Mayweather trouble apart from “Pacquiao would pressure him more,” I would like to hear your argument. I have been waiting for 4 years to hear a valid argument based on styles and boxing skills to why Pacquiao would win? I believe if Pacquiao gets past Brandon Rios on November 23rd, the fight the boxing world should be asking for is Pacquiao vs. Canelo, but that’s only if Canelo can still make 152lbs. I think that would be an exciting fight and I believe it would end with Pacman’s lights out late on in the fight. The only fighters that would make an interesting fight with Mayweather, if they occupied the same weight class, would be Andre “SOG” Ward and Bernard Hopkins. I still believe Mayweather would beat both but it would be interesting as they all fight with brain rather than brawn. Final word on this article is “Brains always beat Brawn” every time.